Eden, New York's Original American Kazoo Company is still churning out zaniness. How to make a metal kazoo. In 1916, a sheet metal shop in a town south of Buffalo, New York, decided to engage in a new endeavor: the manufacture of kazoos, a toy instrument craze brought to the area by a traveling salesman. The gambit paid off, as the easy-to-play novelty shortly thereafter rose to prominence in vaudeville and jug bands and was featured in a surprising number of early musical recordings. Proving capable of keeping up with the growing demand, the Original American Kazoo Company cornered the market, ultimately becoming the only manufacturer of metal kazoos in North America. At its height, the factory was producing 1.5 million kazoos annually, using equipment and facilities largely unchanged from its early days in the midst of World War I. Eventually changing hands and transferring the bulk of kazoo production responsibilities to a facility in the Hudson Valley, the site is known officially today at the Kazoo Factory, Museum, and Boutique Gift Shop of Eden. Most of the original machines and infrastructure are still used to make kazoos (albeit a smaller number per year), making it a rare example of a fully operational industrial museum. 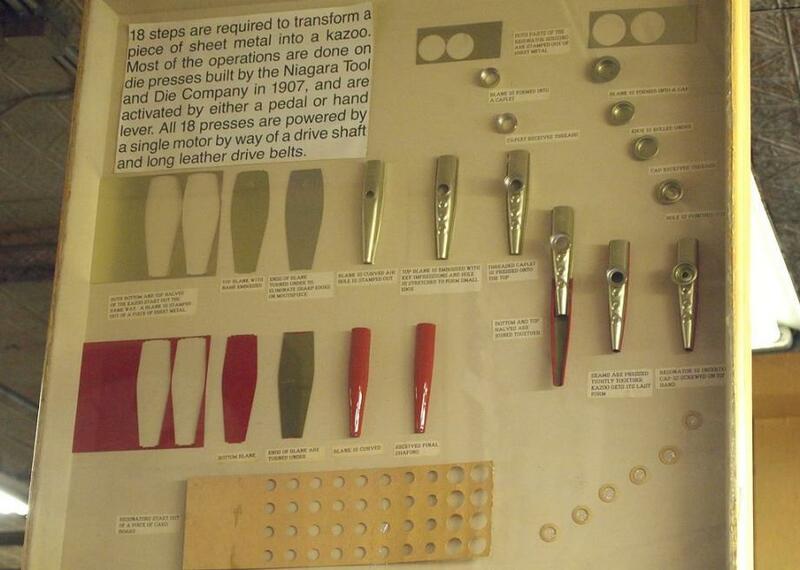 Visitors can tour the small factory and museum and observe the step-by-step making of metal kazoos. There are also one-of-a-kind specialty kazoos on display.